2017 is off to a flying start with the fast-paced sci-fi adventure from Patrick Ness. It wasn’t a short book by any measure but for many of your it seemed to fly past! As always if you have not read The Knife of Never Letting Go yet please look away! The discussion questions and comments will contain spoilers for the first book in the Chaos Walking trilogy. *Please Note* If you HAVE read past the first book in the trilogy please limit your comments to plot points in the FIRST book only, as many will not have read the later books yet! Remember: These questions are a guide only, feel free to answer them in any order or not at all. And email notifications can be a bit haphazard, so please check back to see if you have received replies from your fellow readers! What were you overall impressions of The Knife of Never Letting Go? And star rating if you gave it one? How did you find the unusual spelling and representations of the ‘Noise’ in the text? The title is The Knife of Never Letting Go. How did you feel about the Knife’s presence in the story? Did you find the ending satisfying? And will you be continuing the trilogy? In February we will be reading The City of Woven Streets, or The Weaver as it is known in the US. It is the first of the 2017 #readtheworld novels focusing on stories by authors from around the world. For a full list of the 2017 reads announced so far click here. 1 & 2. Overall I loved this book! Of course it wasn’t perfect, but I don’t think a perfect book exists! I really enjoyed the creative way that language was used to emphasize Todd’s lack of education without distracting from the experience of reading. And I really liked the chaotic ‘noise’ being represented on the page as blocks of crazy fonts – it really helped me visualise how overwhelming the noise would be. 6. This is my favourite quote and moment in one: “It’s like the song of a family where everything’s always all right, it’s a song of belonging that makes you belong just by hearing it, it’s a song that’ll always take care of you and never leave you.” The song of the giant elephant-like creatures. I just adored this moment, the thought of a song of belonging that Todd so desperately needed made me tear up. Though the moment was filled with song, it felt like a silent pause in the narrative, a moment when at least one good experience is allowed to happen to Todd. 4. There were so many great quotes relating to the Knife throughout the book. I felt like it had a looming presence as a protector and an item of fear for Todd. Could he really bring himself to kill? And once he has, could he possibly live with himself afterwards? These are big questions for a teenager to be grappling with, but I felt like Ness never held back from making the feelings and consequences of death at your own hands really impactful. 3. Overall I found the characters really convincing and believable. There were only some minor things that annoyed me: Aaron who never dies was like some kind of evil zombie by the end and I found that a bit over the top, though he certainly was terrifying. Also Ben’s presence at the end of the book for a single scene. I know he was necessary so that Todd could say good bye and learn about the past in Prentisstown, but it kind of undercut the journey that Todd and Viola had taken if he was able to catch up despite having to go around because of the broken bridge and not having a horse. My favoutite part about Todd’s character was how his relationship with Viola and his attitude towards Women – essentially aliens to him- evolves throughout the book. 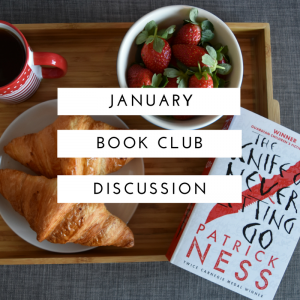 First time contributing to the book club discussion so I am excited! I honestly had little expectations before reading this book and had been previously reading more heavy going non-fiction, so I was immediately drawn right into the fast paced, thrilling style of The Knife of Never Letting Go. I have a soft spot for dystopian fiction too. Overall impression was it was such a captivating way to tell a story about not only Todd and Violet but of humanity in general – our weaknesses, our vulnerabilities, our innate desire for human connection and for truth. Not a fan of ratings but I’d give this 4/5. The concept of the Noise was such a fascinating way to depict the disparity between what we think, what we say, and how we perceive each other. I guess it helped amplify the effect but maybe it also dampened my imagination of it, as the unsual font stands out so much I didn’t have to “try as hard” to imagine how infiltrative it would have felt. The Knife – kind of like the Ring. With great power comes great responsibility. And great burden for its bearer. The ending was such a cliffhanger! After so much despair throughout the novel I felt like all hope was lost at the end. But I am looking forward to reading the rest of this trilogy! “You close yer eyes and as clearly and calmly as you can you tell yerself who you are, cuz that’s what gets lost in all that Noise.” I really liked the simplicity in this. Something as simple as remembering who you are is the anchor in dark times. And if you lose yourself you’ve lost everything. I really liked the story! It was gripping, fast paced and I could feel my heart beating fast to the point of almost leaping out of my chest while reading all the intense scenes! I’d give it 4 out of 5 stars and I look forward to reading the sequel. At first I wasn’t a fan of misspelled words, but later I adapted to it and I liked how it emphasizes Todd’s illiteracy. And speaking of Todd… he wasn’t my favorite character and I had a hard time warming up to him. As the book progressed and he bonds with Manchee (who is my favorite part of the book and totally broke my heart) and starts to understand Viola I liked him more and more though, and I can’t wait to see how his character develops in the next books. I do have to say that I liked how realistic the characters felt – even though Todd is a bit unlikeable at first, he acts exactly like you would expect a 13 year old boy to act, and I liked Viola’s stuborness and her strenght. As Tamsien already pointed out, Aaron felt a bit like an exaggerated menace towards the end and it annoyed me that he just wouldn’t stay dead. The ending has left me speechless and I kept rereading the last few lines, saying “wait what! Nooo, that can’t be it!! !” What a cliffhanger!!! As it happens with many of the books I read, I didn’t know much about this book, other than the concept of noise, which I immediately loved. At first, I found it a bit difficult to get into the story, but that was more due to the novelty of the format, with Todd narrating/talking just as he thinks – ha! Noise! Once I understood that, and got used to Todd’s voice and the surrounding noise, it became easier to follow. As the story progresses and we get to know Todd and are more familiar with the world he lives in, I started appreciating the writing style. It was hard at first, to look past the misspellings and the “slang,” but I realized soon how helpful it was to actually visualize and understand the concept of Noise – of unfiltered noise. Like how Todd tries to think of other things to “hide” the truth. And how men, when asleep, can’t use those mechanisms, so everyone sees what they’re thinking/dreaming of. Imagine having that little control of what goes inside your head! Todd, as a character, I found really convincing. First, as Alja pointed out, he wasn’t a particularly likable character at first, and the way he treated Manchee did little to make me like him. However, his development was very interesting – with Ben and Cillian, with Manchee (and I’m as heartbroken as everyone on this,) and especially with Viola. From never seeing and much less interacting with a girl, he gets to share this kind of adventure with one. I remember that scene where they meet this woman (sorry, I don’t remember the name) and he kept thinking of her in “he/his” pronouns – and he had been around Viola for a while, now. Imagine just how difficult it was for him to wrap his head around the idea of there being actual women, and not just from the dreams he saw in other men’s Noise. Plus, Todd had been used his whole life to Noise, to hear and being heard. But then comes a girl and he can’t hear anymore. He can’t keep a secret, but she can. It is very interesting to see him dealing with it, and also to see Viola deal with all that unfiltered Noise she gets from him. Imagine hearing every thought of every person around you. All. The. Time. I also remember being very intrigued by the Mayor and highly disliking Davy. But my biggest issue was Die Hard Aaron. I understand his drive and how fixated he was with the whole situation, and while he, as a character, was convincing, I had a very hard time believing he would survive everything he went through. By the time he finally died, I kept expecting him to pop out of somewhere. The ending. That ending. I stared at my book, then at my boyfriend, then at the book, then at the wall, then back at the book. That could have not been the ending. After all that running around and still half-expecting Aaron the Energizer Bunny to make another appearance, you give me that ending? I love-hated it. I blame the cliffhanger. There are so many wonderful quotes and moments throughout this book. Tamsien already mentioned one of my favorites – not just the quote, but the whole scene and that feeling of belonging and calm. Another simple, but powerful one, especially in this story, is “We are the choices we make.” Todd is just a kid, but he is forced to make choice after choice – choices that shape him along the way. There are also multiple quotes illustrating Todd’s despair (and that ending was the final blow) “Hope may be the thing that pulls you forward, may be the thing that keeps you going, but that it’s dangerous, that it’s painful and risky, that it’s making a dare in the world and when has the world ever let us win a dare?” Even though Todd wasn’t the most likeable character at the beginning of the story, after all he goes through and all the curbs the world keeps throwing his way, you just want to hug him and keep him safe. He is just a kid!